Our Tetris 99 tips are great and all, but what's better is getting to play for Actually Free without even buying a Nintendo Switch Online subscription? It just so happens that you can get a seven-day trial of Nintendo Switch Online even if you've already used the standard trial, just by checking out a new Splatoon 2 demo that Nintendo's dropping this week. See what you could be playing soon with our list of upcoming Nintendo Switch games. The Splatoon 2 Special Demo is available to download on the Nintendo Switch eShop right now. Once you download the demo, Nintendo will email you a code for your free Nintendo Switch Online trial. You'll have to wait until 7 am PDT / 10 am EDT / 2 pm GMT on Tuesday, March 19 for the Nintendo Switch Online trial to go live and the demo period to begin, but you don't have to actually play Splatoon 2 to take advantage of the other benefits. You're free to download Tetris 99, check out all of the games in the Nintendo Entertainment System - Nintendo Switch Online collection, take advantage of cloud saves, and play other Switch online games while the trial is live. Again, this trial will even work for folks who have already redeemed the standard seven-day trial option for their Nintendo Accounts. The trial (and demo) will expire on Monday, March 25 at 6:59 am PDT / 9:59 am EDT / 1:59 pm GMT. Be aware that your free trial will automatically roll into a one-month recurring subscription once it expires, since you need a credit card on file to start. Make sure you head to your eShop setting page and disable the automatic renewal if you don't want that to happen (and check out our guide to Nintendo Switch Online cheap deals for more options). 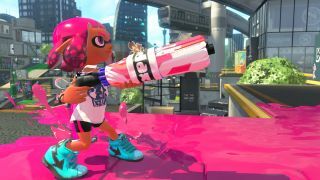 Also, maybe give the Splatoon 2 demo a try even if you doesn't seem like it'd be your thing. It's a refreshingly untraditional online shooter with vibrant style and killer music. Plus, there will be a bunch of other new players jumping in with the demo, so you'll be less likely to get demolished by kitted-out elites who have been playing nonstop since the game came out. Check out a new online-focused game for Switch, an update on the Super NIntendo World theme parks, and more news from Nintendo's latest shareholder Q&A. Or just sit back and enjoy this Pokemon Sword and Shield gameplay.